In my 30 Days of Thankful series, every post I've written has been very personal, but...this one was harder to write than others. Running has brought me such joy and such sadness over the years. It's been a love affair of sorts. Growing up, I was completely unathletic. I played basketball for about 30 seconds in middle school. I was an alternate on the tennis team. And once high school rolled around, I realized I was better suited for things like band and drama club. Like your typical band nerd teenager, I struggled with self esteem issues. I wasn't happy with how I looked, my weight...along with plenty of other things. In particular, my weight always bothered me. I couldn't fit into the cute clothes that the other girls in school wore, so I dressed outlandishly. In thrift store garb one day and vinyl pants and black lipstick the next. I look at pictures now and cringe. College was a little better, but I was still unhappy with my weight. My mom and boyfriend at that time assured me I looked great, but I never felt that way. I would starve myself to try and lose weight. As I've learned through my recent discovery of codependent traits in my life, this was basically a power struggle with myself. I was so unhappy with myself for other reasons and starving myself gave me a high of sorts. A feeling of power when everything else felt out of control. I kept doing this for years until I discovered something that would change my life forever - running. I'd really never thought about running. I was overweight. Unathletic. I'd attempted to run once or twice but never really liked it. 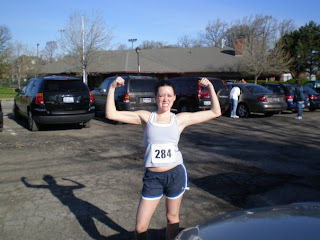 But in 2007, I decided I was going to run in a 5K. Why? For no real particular reason. I was working in a department with a lot of young people, and one day we were all talking and thought "why don't we do this." So a bunch of us decided to sign up for a 5K. The Lakewood Hospital Ambulance Chase. To be honest, I was completely freaked out. I barely knew how far a 5K was let alone how I was going to finish one. My boyfriend at the time was a great runner and he was a great motivator. (although his running awesomeness was a little intimidating to me) He called me the little engine that can. "You CAN do this, " he repeatedly told me. Too bad I didn't believe that myself. I downloaded Hal Higdon's 5K training plan and followed it religiously. Or as religiously as I could. My head wanted to run but my body did not. Some days it felt like every cell in my body was screaming, "STOP," but I refused to listen. And soon enough it was 5K race day. I didn't think I'd be able to run the whole race, but I did. I finished in 26:34. My boyfriend at the time was so proud of me he printed my race results out and put them on the fridge. I think they stayed on that fridge for at least 5 years. I used to look at them every morning when I was making my coffee to remind myself of how far my running has come. After that race, I got the running bug. I ran as many 5Ks as I could find. I talked about the possibility ﻿of someday running a 10K. Someday happened the following spring when I ran the Cleveland Marathon 10K. Then in 2009 I ran my first half marathon in Columbus. I finished in 2:03:09. The following year I came back and ran my first full marathon and finished in a little under four and a half hours. I ran my second marathon in 2011. And this past year, I ran my first 50K. I'm oversimplifying my journey in distance running. This didn't come easy to me. I injured both ankles along the way. Had to wear a boot cast on either foot at different times. I had to go to physical therapy. After I ran my second marathon in Cleveland in 2011, I got a stress fracture and spent the entire following summer sidelined. I thought at one point I might never run again. Heck, people in my life encouraged me to never run again. But if there's one thing I'm not, it's a quitter. Running has brought me so much happiness and so much pain. I've gotten a sense of accomplishment from training for and completing so many different races. I've gotten into the best shape of my life and I've never been happier with how my body looks and feels. I joined a running club and met some of the best friends a person could ask for. But at different times, I've taken running a little too seriously. Missed out on having fun with the people in my life because I had to train or had to go to a race. I pushed myself too hard and in turn, pushed other people away. Heck, my boyfriend at the time used all the time I spent training for my first marathon to start a relationship with someone else while I wasn't around. But I really wouldn't go back and change a thing about my adventures in running. Every run, every race, every injury...it's helped to make me a better runner and a stronger person. Just like most other things in my life, my perspective on running has really changed in the past few months. While nearly every runner I know is already planning out their running schedules for 2013, I don't plan on signing up for anything. I want to run for fun for awhile and see what that's like. No pressure. No goals. Just my feet and the ground. Because one of the few things I know for certain is that there's nothing that makes me feel better than a good run. It lets me clear my head, see the beauty around me, and help me realize what's really important in my life.